With the acceptance of full time employment an employee makes a commitment to the organization to devote their time and energy to performing all of the functions of their job description. External activities are not to interfere with an employee’s commitment to their primary employer, when this happens a conflict of commitment exists. In most organizations the degree to which a commitment is required is dependent on the level of an employee within an organization and their contract or agreement that was established when they were hired. Organizations can either have a separate conflict of commitment or they can include it in their conflict of interest policy. Employees should be encouraged to participate in professional organizations and public service activities. These types of activities will enhance the value of the employee to the organization and will enhance the image of the organization in the community. The question becomes – When are an employees external activities interfering with their primary job responsibilities? 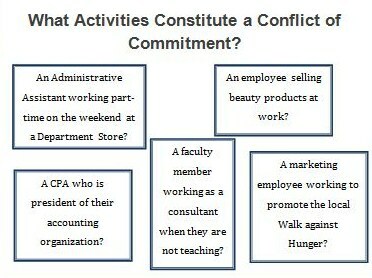 Conflict of commitment policies are common in colleges and universities. I believe they will become more prevalent as employees take on second jobs. Employees working as consultants or owning and operating websites may have a conflict of commitment if these second jobs interfere with their primary employment. Clark Atlanta University needed a Conflict of Commitment policy to ensure that all full time employees met their obligation to the University. As part of the process for developing the Conflict of Commitment policy I asked the executive team several questions: Would a full-time faculty member running a consulting business have a conflict of commitment? Would an employee selling beauty products at work have a conflict of commitment? Would an admin assistant working part-time at a department store on the weekend have a conflict of commitment? It is up to each organization to determining what constitutes a conflict of commitment. When I understood what the University considered a conflict of commitment I developed a Conflict of Commitment policy along with procedures and process flows. Are you ready to get started on your Conflict of Commitment Policy? An initial consultation is only $100. Here is what you get. The $100 fee is applied to the cost of developing your Conflict of Commitment Policy if you decide to use Jackie Willey. Jackie Willey is available for a free 30 minute consultation to discuss your Conflict of Commitment Policy and help you develop the best strategy to meet your needs.